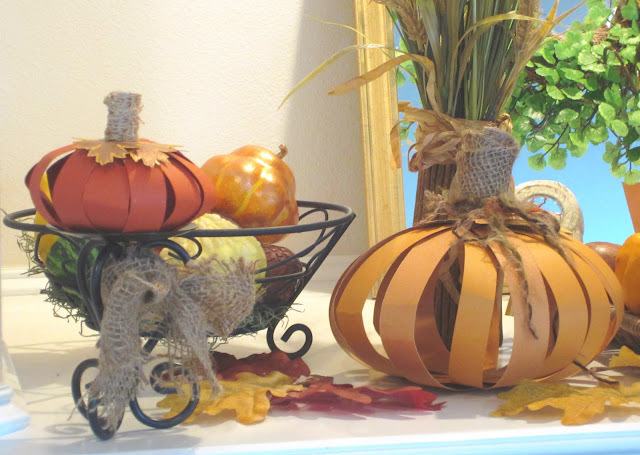 I decided to create some paper pumpkins and add them to the new rooster I bought and create a new mantel. 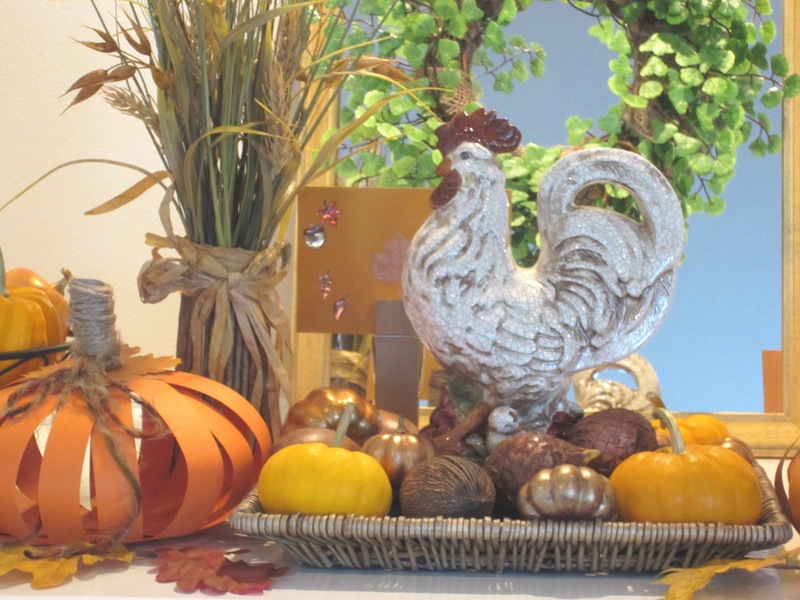 This is my one and only rooster so I thought I would go with a rustic look for my mantel and use an eclectic mix of items that I found recently. I didn't have time to put a new wreath together, so my late summer one will have to do for now! 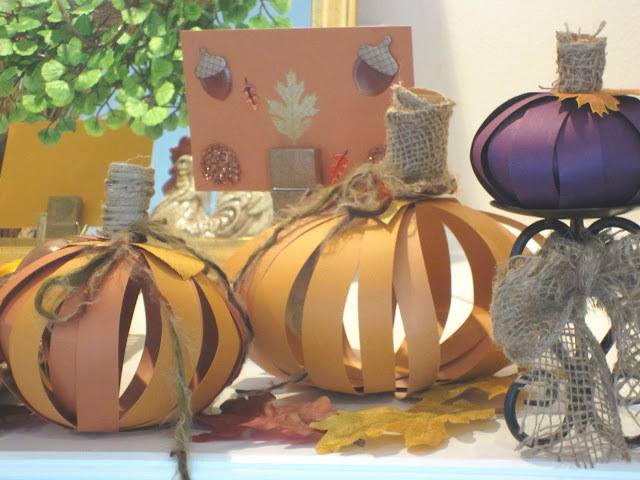 I created these with strips of cardstock, stamped leaves, burlap and jute covered stems. 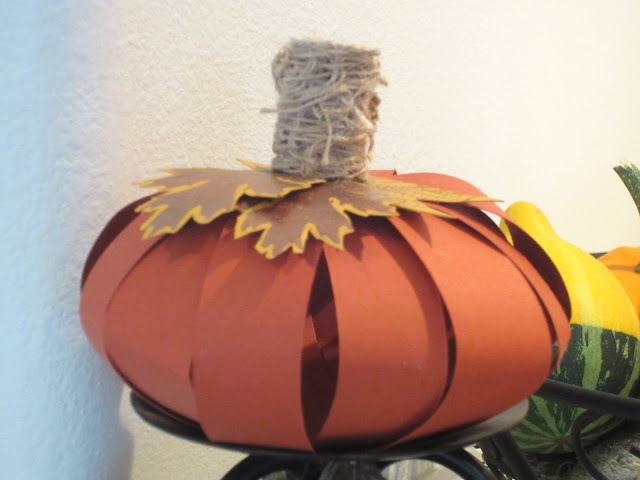 There are so many directions you can go with paper pumpkins and since I have quite a collection of papers I used those. These are so easy to make, depending on the method you use. I simply glued the strips together from the bottom in a circular pattern and the same on the top. The strips overlap quite a bit on the top but any decoration will cover that. stamps which I used to make the leaves and I added yarn for a bow. Since I have been crafting for several years, I have many of these things on hand already. 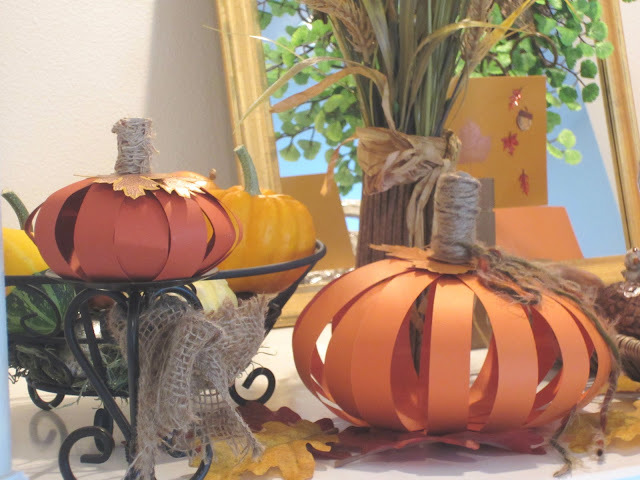 I made some tiny little pumpkins to sit on top of my candleholders. My pumpkins come in all colors! You can't have a rooster without adding some wheat to the mix. I enjoy the organic look of something natural. I also like the softer colors of this rooster that I found at Ross's. I never liked roosters for decorating until I discovered all the pretty roos on the blogs. I had some fall stickers so I added those to make some fallish cards. The large orange pumpkin is probably my favorite because it has the best shape. I should have gotten a closer shot of the leaf detail on this. 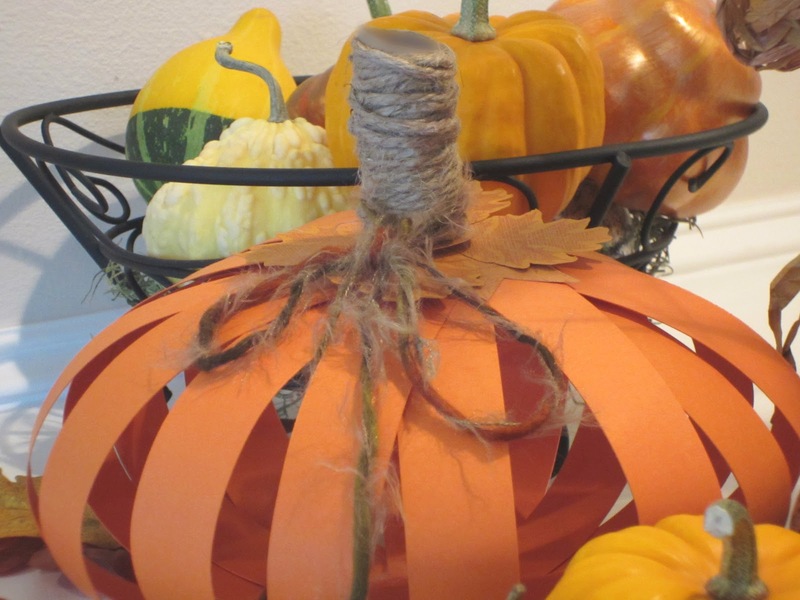 I added four stamped leaves and a jute covered stem with some fall colored yarn. 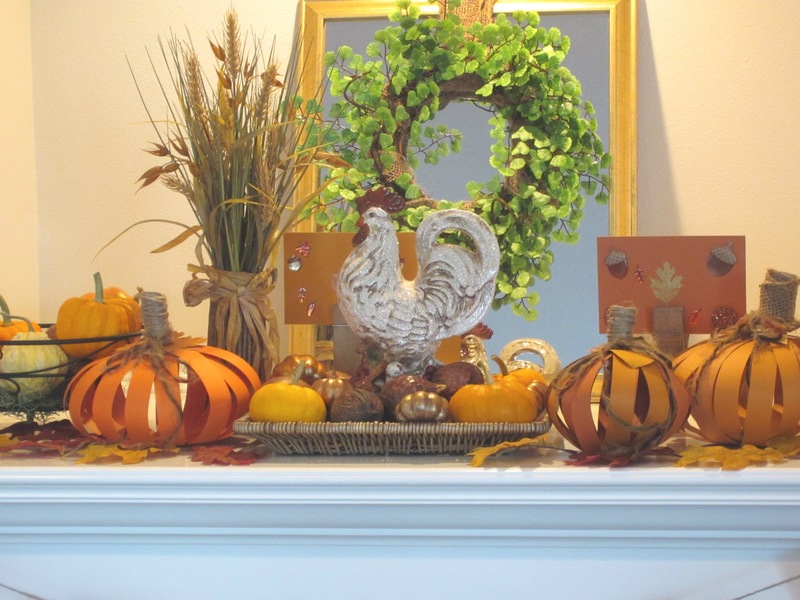 When hubs saw this mantel he called it pumpkin overload, but you work with what you have and as long as you enjoy the process it all works out. Thanks for stopping by! I hope you will take time to leave a comment! 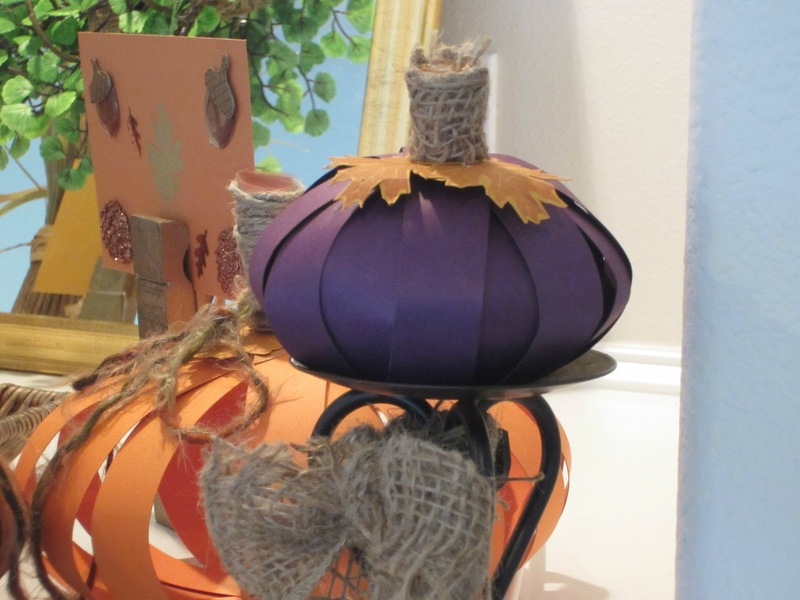 Your paper pumpkins are just darling--love the texture and also that pop of purple! 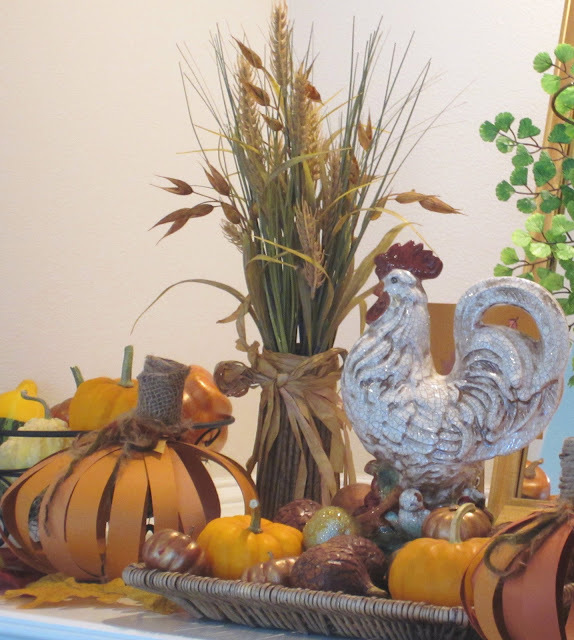 That rooster is so cute--he looks proud:) The wheat is the perfect natural touch--nice job! Thanks for the sweet comments. I got a little carried away with the pumpkins but the paper ones are so much fun! 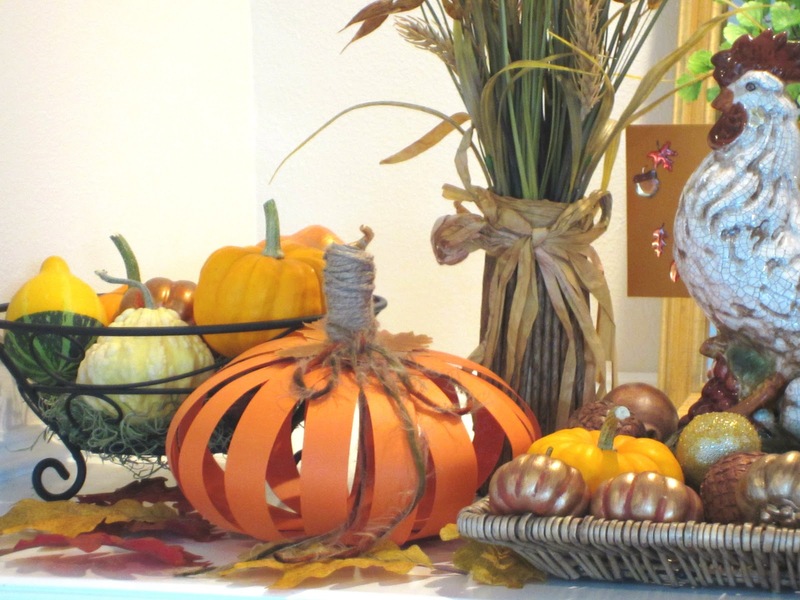 Oh, I love your handsome Rooster (I love Roosters) and your little pumpkins you've made are so cute. Lovely display! Thanks for stopping by and leaving those nice comments Shelia. I've learned to love roosters too! 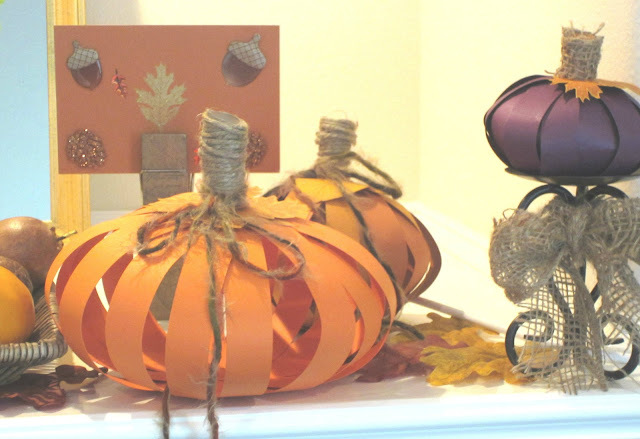 Your paper pumpkins are adorable. The twine stems really make them stand out. I am also a rooster lover! Can't have a kitchen without a rooster! Visiting from the Newbie party and am your newest follower. I would love for you to visit me at Still Woods Farmhouse! Oh How cute. I love the paper pumpkins and I really love the roo too. Thanks for sharing at the party. Those pumpkins are adorable. I am going to make some for my Thanksgiving table. Thanks for the inspiration. oh and I love that Rooster too. Thanks for lovin' my pumpkins and leaving a comment. They were so easy and I hope you make some as well. I'll have to stop by your blog! Your paper pumkins turned out wonderful. they look lovely on your pretty mantel. Thank you for sharing them with us at TTF! I love your pumpkins! Everything looks so pretty! The rooster is awesome! Thank you so much for sharing at A Bouquet of Talent this week. I am so thrilled to have you. Diane ... just love your pumpkins. I saw you on Debbiedoo's and thought you were so creative. Everyone does pumpkin overload for Fall ... so that is okay.